Palo Alto Networks recently closed the books on its fiscal year 2016. We review its biggest achievement over the last twelve months. On August 30th, cybersecurity leader Palo Alto Networks Inc. (NYSE:PANW) reported on its fourth-quarter and full-year fiscal 2016 earnings. Executives lauded another fiscal twelve-month period of record revenue, and highlighted double- and even triple-digit growth among product lines such as Traps endpoint security and the VM-Series virtualized firewall. But the company's biggest win in 2016 wasn't necessarily a new appliance or security solution. A multiyear shift toward subscription services which hit critical mass in 2016 marks the company's biggest win this fiscal year, as it's helped Palo Alto solidify its revenue base for the next several years. To understand why Palo Alto's changing revenue mix is so vital, shareholders should first understand how the company recognizes earned revenue. 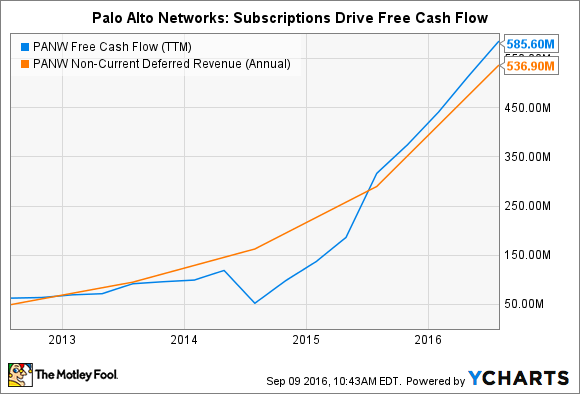 Like many software companies, Palo Alto records revenue on its income statement, and deferred revenue on its balance sheet, while also reporting a "billings" metric to investors each quarter. "Revenue" is easy enough to grasp. It's work performed during a specified period, which a corporation has the right to invoice a customer for and expect payment. "Long-term deferred revenue" represents monies collected in advance which won't be earned within the next twelve months. Conversely, "short-term deferred revenue" is money collected beforehand, but which will be rightfully earned in less than one year. The definition of "billings" can change from company to company. Palo Alto uses a fairly standard definition, in which billings represent the total amount recorded as revenue during a period, plus the change in deferred revenue. The point of looking at billings is that they give an investor a quick reference point to gauge that both revenue and deferred revenue are expanding at a healthy pace. Data source: Company SEC quarterly filings. All dollar figures in millions. An initial observation is that these figures are very characteristic of a software company in high-growth mode. Palo Alto enjoys extremely fast revenue expansion, and even faster growth in billings. Yet the most rapid expansion rate of all belongs to long-term deferred revenue. When billings scale up faster than revenue, it's an indication that deferred revenue is amplifying, and that's certainly what we see here. You'd be correct if you guessed that the long-term deferred tally implies that longer-term customer contracts and subscriptions are on the rise. Image source: Palo Alto Networks Q4 2016 Investor Presentation. What can we make of these two images? First, recurring billings overtook product billings several years ago, as Palo Alto successfully transitioned its customers from being product buyers to buyers primarily of services, re-upping at regular intervals. In 2016, total revenue also crossed this watershed, as the second chart shows. Moreover, recurring revenue is projected to make dramatic gains within the total revenue mix in the current (2017) fiscal year. This crossing-over is the critical-mass event which stands as Palo Alto's big achievement of the last twelve months. To be more specific, billings, revenue, and deferred revenue are all being propelled by the growth in subscriptions for Palo Alto's services. A telling example of this phenomenon is WildFire, Palo Alto's automated malware-analysis engine. Subscribers to this service receive file analysis, threat detection, and prevention, all of which are continually improved by what the company terms the correlation of "community-driven threat intelligence" -- the crowd-sourced knowledge derived from threat analysis across Palo Alto's customer base. With real-time, global updating of threat definitions, and automated response protocols when malware is identified, you can see how IT staffs would be hesitant not to renew this service each period. PANW Free Cash Flow (TTM) data by YCharts. In particular, the rapid growth in recurring services provides sustainable growth in both short- and long-term deferred revenue, increasing visibility into future revenue, higher operating margins over time, and high free cash flow generation. As a result, we are confident that we will continue to deliver high-revenue growth at scale for years to come. Of the tangible advantages listed above, the "increasing visibility into future revenue" may be most important for investors. If you can see future sales clearly on the horizon, it frees up resources today to invest in innovation, undertake sensible bolt-on acquisitions, and utilize funds to create additional revenue streams. That's a type of self-perpetuating cycle which only increases shareholder value over time.